Trowulan's Pendopo Agung is believed to be the site of a royal audience hall, dating from the time of Mojopahit. 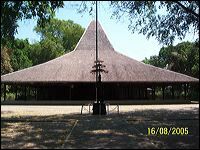 In recent years, a new roof has been contracted, under which can be seen photographic portraits of the commanders of the East Javanese Armed Forces' Brawijaya Devision. The pillar supporting the roof rest on the original stone foundations.